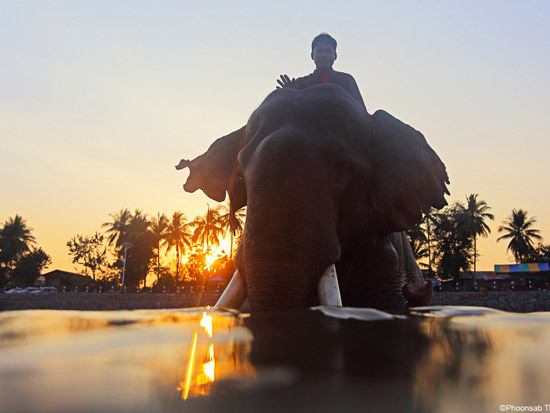 Cycle through rice paddies and forests, visit hill tribe villages and hidden monasteries, learn about traditional weaving and admire the elephants in an elephant camp. A unique and fun way to experience the countryside around Luang Prabang. After breakfast, drive out of town to Ann Village about 25 KM from town, where will start kayaking along Kharn River for about 3 hours. There you can see daily lives of locals finding food along the river bank. Many of those construction workers, some of them collect sand, stone along Kharn river to sell for construction companies in the town. Some of them are farmers, planting seasonal crops including eggplant, ginger, pumpkin, chili and other vegetable along the bank of the Kharn River. We make a short stop to visit Tadsae Water Fall, where the most beautiful during rainy season. Most of local people gather for picnic during weekend. Arrive at Ban Noon’s Elephant Camp. After an introduction about the camp and the elephants, we take an elephant ride for hour and half throughout the jungle down to Kharn River. After lunch, drive back to Luang Prabang. 1 Day Culture, Historical and Villages Trekking Local H'mong village where the culture, customs and language are all different to mainstream Laos.Your trek starts from the H'mong village and takes about three hours through primary forest and jungle on the way visit the Hermit cave, jungle, and waterfall. Around 0830am, Meet your guide and Visit Ock Pop Tok Weaving Center, where local are weavers and you can also find local nice silks: https://ockpoptok.com/. After that we will enjoy a short visit through the Luang Prabang countryside. On the way you pass through beautiful scenery and rural landscapes with rice terraces and pineapple fields. 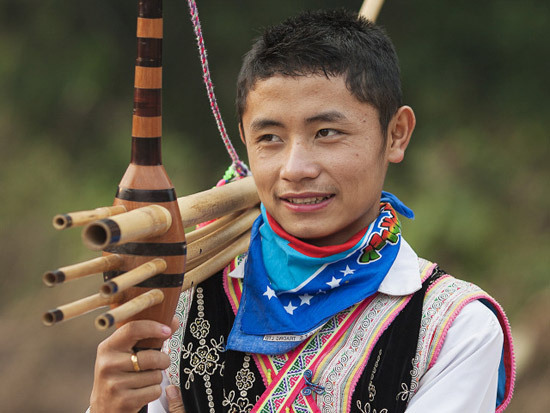 You visit Ban Long Lao, a local H'mong village where the culture, customs and language are all different to mainstream Laos. 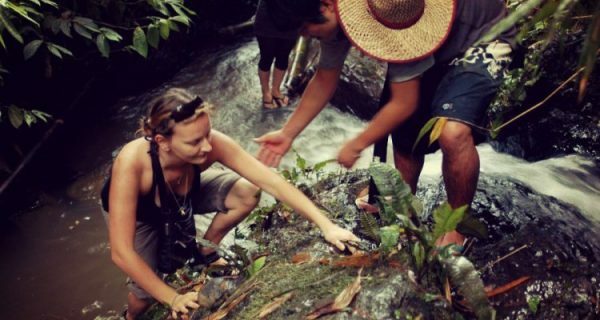 Your trek starts from the H'mong village and takes about three hours through primary forest and jungle on the way visit the Hermit cave and refreshment at the spring before reaching the spectacular Kuang Si Waterfall. Lunch can be taken at the falls with time for relaxation, swimming and the possibility to climb to the top of the waterfall. On return, stop and short tour visit Buffalo Dairy Farm: http://www.laosbuffalodairy.com/, The tour will be lasted about 40minutes -Tour included a guide tour of the mini farm, Buffalo feeding & Washing, Milking Demonstration, & Feeding Chickens and rabbits. Arrive in town, and transfer to your hotel. In the evening, visit the Monkey dance show at the national museum. 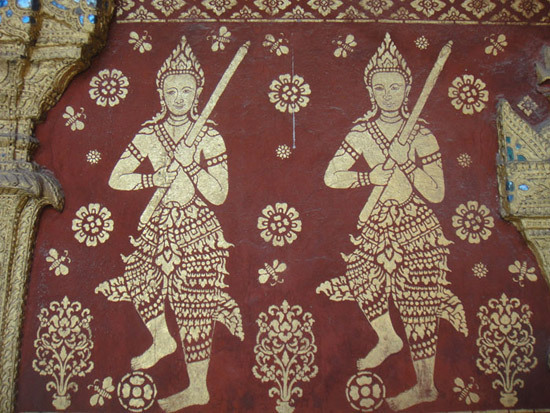 It is the traditional dance of Luang Prabang, that is difficult to find in other places. This show will start about 6:30 pm, actors will dance for 1 hour. 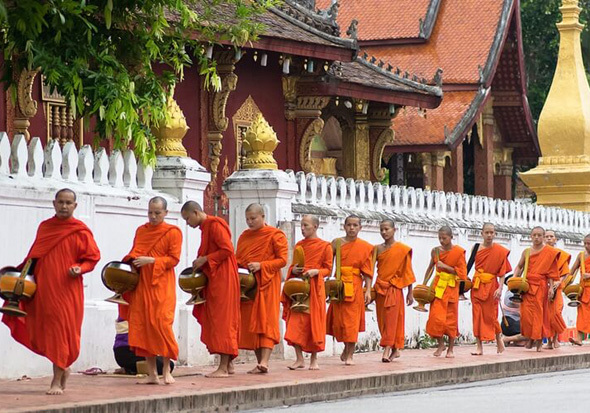 Early morning, enjoy giving Alms Bowl to the monks on the street for making a merit. The Buddhist monks carry for their collection of food as they walk around the village near by only one time a day, early morning. It's a belief that in order to give people to gain merit before they will start their day life, normally people will have to go to Buddhist temple, but in this case it's to give people opportunity to do at home, it is not the way of begging as they never ask for any food and even wait for those who are late for giving alms in the morning.